In this article, I will cover a list of 10 free online pie chart maker websites. Here are 10 free websites to make pie charts online. All these websites offer simple to use tools take input data and make pie charts for that. These pie charts are customizable means you can change their appearance, choose a 2D/3D representation, and add labels to show data values. Some of these websites make interactive pie charts where you can make changes directly in the pie charts. In the end, the pie chart can be exported as a PNG, SVG, or PDF file. Meta-Chart.com is a free chart maker web application where you can make various types of charts. You can make 2D and 3D pie charts here. The process of making professional-class pie chart involves three simple steps. In the first step, you can select the color scheme for the chart and choose whether you want a 2D pie chart or 3D pie chart. In the second step, you have to enter the data for the pie chart. You can type your data here, paste data, or import from a CSV file. After entering the data, you can add labels to the pie charts in the third step. Once you complete all these steps, this application makes a pie chart as per your inputs which you can view in the Display section. There, you can try various themes and select which labels you want to display on the pie chart. After finalizing the chart, you can download it as a PNG, JPEG, SVG, or PDF file. You can try this online pie chart maker here. ChartGo is an online chart maker tool to generate pie charts, line charts, bar chart, and area chart online. With this tool, you can easily make pie charts. To do that, select the pie chart option from the homepage, this will open chart settings on your computer screen. Here, you can define the chart settings as per your needs. You can set the chart size and add labels. It also gives you options to show 3D, Gridlines, Legend, Values, Shadow, and Border. You can also add a color gradient effect and transparency to the chart as well. 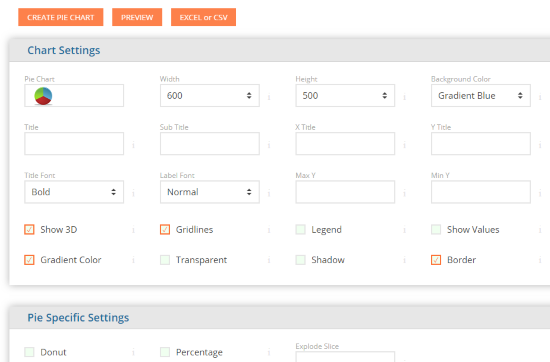 After specifying all these style and customization settings, type enter your data for the chart. You can also import data from an Excel file as well. Below the chart settings, there are pie specific options where you can choose whether you want the Donut pie chart or percentage pie chart. If you want to highlight a specific slice of your pie chart, you can do that by entering the number of that slice in the Explode slice box here. 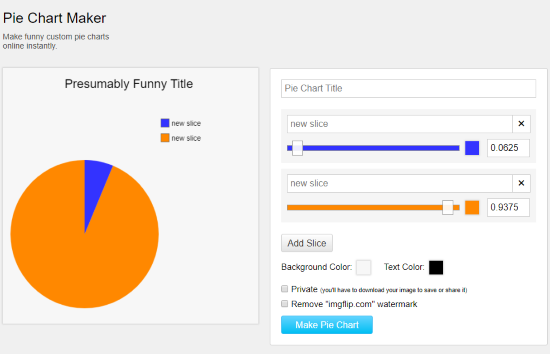 Make pie chart online with ChartGo here. OnlineChartTool is a free website to make various types of charts to represent data. On this website, you can make bar chart, line chart, area chart, pie chart, bubble chart, meter chart, and more. The process of making a pie chart is pretty straightforward here; it involves 5 simple steps. In the first step, you can make a design for the pie chart using the given options. You can make a normal percentage chart or a Donut chart, choose chart color, type, appearance, etc. The second step asks you to enter the data for the chart where you can either enter the data or import a CSV file. The third step is to add labels and select the font and color for the labels. In the fourth step, it shows you a preview of your chart. If you want to change something at this point, you can go back and make the changes. Otherwise, you can move to the last step where you download your chart in various file formats. These formats include PNG, JPG, SVG, PDF, and CSV formats. Try this online pie chart maker here. As the name suggests, RapidTables offers various online tools to quickly make tables, charts, design, etc. With its online Pie Chart Maker, you can easily create pie charts in minimal time. This tool gives you straightforward options to enter the chart details. 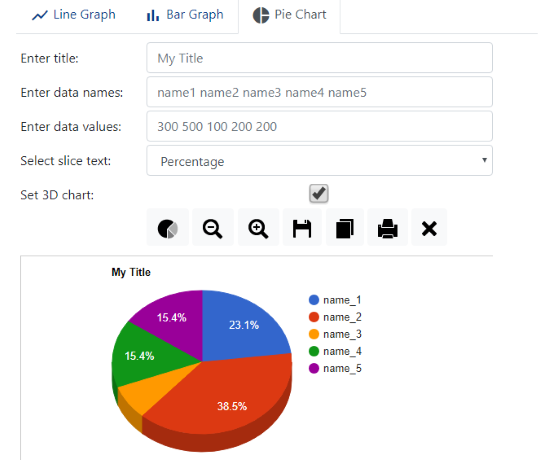 You can enter a title for the chart along with data names and data values separated by space. It also has a Slice text option where you can choose what you want to show on the pie chart. If you want to change something at this point, you can go back and make the changes. Otherwise, you can move to the last step where you download your chart in various file formats. These formats include PNG, JPG, SVG, PDF, and CSV formats. Give this online pie chart maker a try here. LiveGAP.com a free online chart generator web application. It packs a set of powerful tools which helps you create stylish charts. To make pie chart here, go to the Chart option and select Pie Chart. This tool offers three types of charts, 2D/3D Pie Charts, Sketchy Pie Charts, and Donut Pie charts. After selecting the chart type, simply paste your data into the table to make the pie chart. 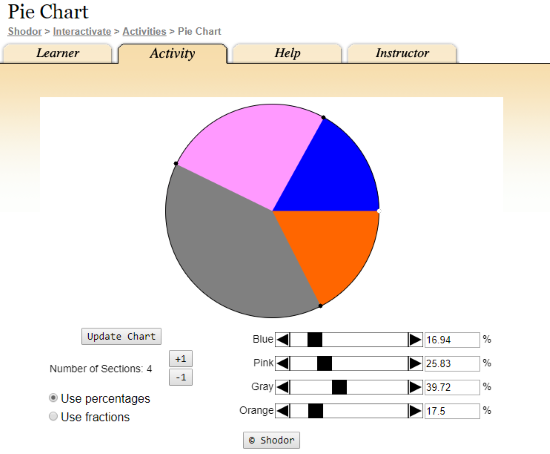 Then, you can customize the pie chart by selecting colors for chart slices and adding in-graph data. You can also scale the size of the graph and add animation as well. With the animation option, you can try out various pie chart style and designs. 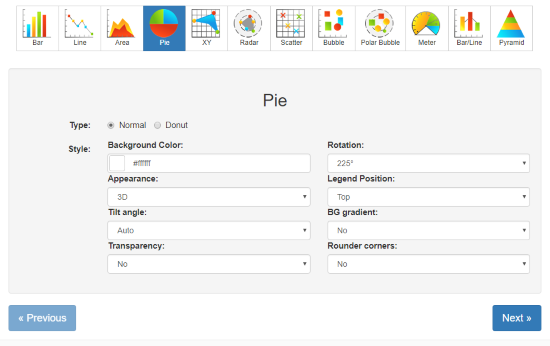 This way, you can make professional and sketchy pie charts here. PieColor.com is another free online pie chart maker tool. Making a pie chart involves two simple steps here. The first step is Values and second is Options. In the first step, it gives you textboxes to enter the values for the pie chart. Besides that, there are options to select the color for each value and name it. The second step is to add other parameters to the chart. 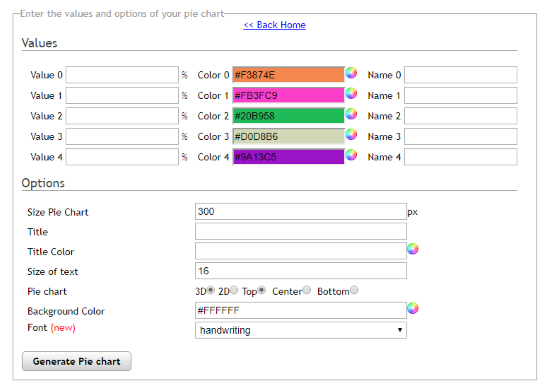 Here, you can type a name for the chart, select its size, select text size, background color, font, and chart type. This tool has 5 chart types. 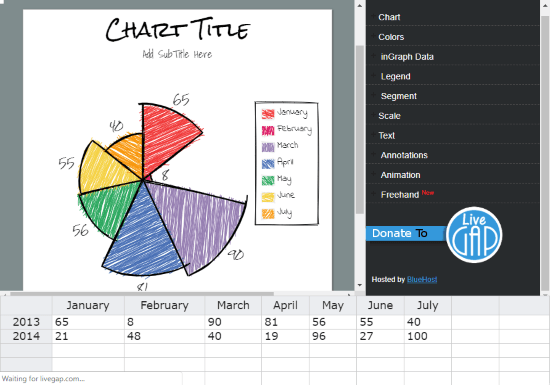 You can make 2D Chart, 3D Chart, and half pie chart covering the top, middle, or bottom area. After filling all these options, click the “Generate Pie chart” button and this tool will make the chart for you which you can download as a PNG file. Make pie chart online with PieColor here. NCES.ed.gov is a free educational website that provides resources and tools for students from Pre K to 12th. This website offers a free tool to make pie charts. This tool has 14 textboxes to enter the data. You can enter your information in these boxes, add their names, values and choose a color. Fill the number of slices you want in your pie chart and leave the rest blank. After that, you can select a size for your chart. You can make Small, Medium, Large, or Xtra-Large charts here. By default, this tool makes 2D pie chart but you can also make 3D pie chart by checking the 3D checkbox while making the chart. Then, you can select a format in which you want to download your chart. You can choose PNG, JPG, PDF, or SVG format and download the chart to your computer. You can try this online pie chart maker tool here. Imgflip.com is an online collection of trending images, memes, and GIFs. To keep this collection growing, this website offers simple tools to make meme, GIF, and Pie Charts. You can use these tools to make pie charts here. 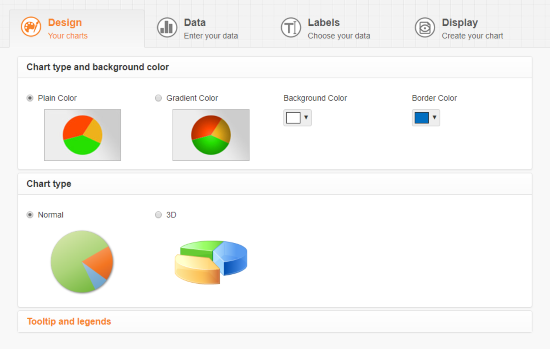 The pie chart tool shows you a preview of the chart on the left and various customization options on the right. Here, you can enter the information for the chart and see a live preview of it. By default, the chart has two slices, you can name them, add values, and choose their color. With the “Add Slice” button, you can add new slides to the chart and enter their values. This way, you can easily make pie charts here and download them as PNG files. You can also publish them to Imgflip if you want. Shodor.org is another free website where you can make various types of charts online. It has a pie chart maker which you can use to represent your data on a pie chart. This is a simple tool that doesn’t give you much customization options. Instead, it lets you quickly make a pie chart with value scroll-bars to analyze the data. To make the pie chart here, add the desired number of slices to the chart. Then type the percentage value for each slice. The changes you make to the input is reflected in the chart instantly. This way, you can quickly make a simple pie chart here and download it as a PNG file from the right-click context menu. InstantPieChart is the simplest online pie chart maker website on this list. Here you can make a custom size pie chart which you can later download to your computer. The custom size option lets you specify a chart size so that you can directly use it without the need for further editing. 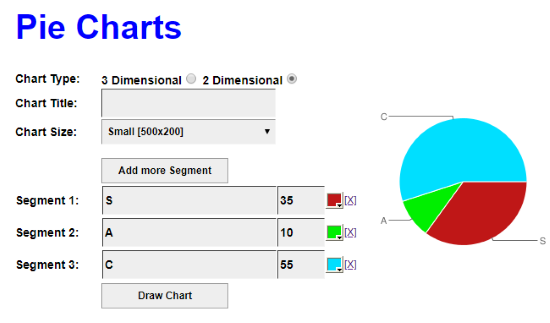 To make a pie chart here, first, select the chart type, you can go with a conventional 2D chart or make a 3D chart. After that, enter a name for the chart and set its size. 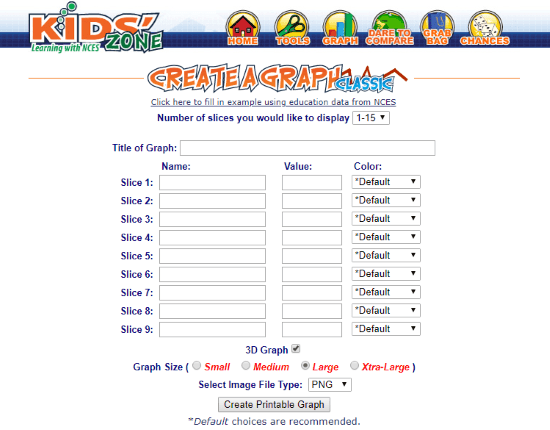 Then, add the desired number of slices to the chart, name them, enter their value and color code them. After filling all these options, click the “Draw Chart” button to make your chart. These are the 10 free online pie chart maker websites. All these websites are simple to use. Most of them let you make details-rich pie charts which are good for professional use. Whereas some are good to quickly represent data on a chart which can be useful for research and analysis.